You should be really proud. You've completed 6 major project management topics covering all aspects of initiating, planning, executing, monitoring and controlling, and closing a project. That's FAR more than most people will ever learn, and sets you up for success in every project you tackle in the future! We want to thank you for taking this course. If you apply the concepts you learned in these 6 lessons, the grass should be greener both at work and at home when it comes to getting organized and getting jobs done. PLEASE NOTE: It's important to us that you fill out our course evaluation form below. Keep in mind, any updates we make to this course will be yours, free, in the future. Give us your candid feedback (it's anonymous) and we just may add some things you are looking for that aren't in there now! Please fill out as honestly and completely as you can. This evaluation will be anonymously emailed to us to make the course better in the future. Once you submit, we'll redirect you to the Project Management Toolkit so you can download the blank templates and use them with your own projects! What did you find least useful about this course? Will you be able to use what you have learned in this course? Why or why not? If you answered "Yes" to the above, please provide your email address so we can get in touch. One of the biggest things project managers skip is the Project Closing phase. This is important, especially if you ever hope to run a successful project again. When you've finished this lesson, click the button below to complete the course, see where to go from here, and submit an evaluation! Take this quiz before moving to the summary and evaluation to ensure you've learned the concepts. Answers will be shown immediately after filling out and submitting this form. Matching the project schedule to the outcome. Lessons learned should be captured during? At this point in the course, you are more than halfway done! Congrats on making it this far. Now let's cover one of my favorite parts of project management, monitoring and control. Once the project is underway and execution has begun, we need to keep track of the schedule, risks, quality, and costs. Perhaps most importantly, we need to prevent scope creep which is the unnecessary addition of new requirements (one of the biggest killers of projects). When you've finished this lesson, click the button below to move on and begin Lesson 6 - Project Closing. Take this quiz before moving onto lesson 6 to ensure you've learned the concepts. Answers will be shown immediately after filling out and submitting this form. Project initiation, planning, and execution. Project schedule, cost, and scope. Project monitoring, control, and risks. Project quality, scope, and schedule. The goal of monitoring is to identify __________ the project plan and take corrective or preventative action as needed. __________ control is the process of monitoring specific project results to ensure they comply with quality standards. __________ control is the process of effectively managing changes and integrating them appropriately across the entire project. The Project Manager should __________ changes to the project scope, schedule, and budget. Deliverables must be formally accepted by __________ before they are considered complete. What three values does earned value analysis integrate to accurately assess the project? [CORRECT ANSWER] Project schedule, cost, and scope. In this scope management activity, you are the manager of a project focused on building a new website for your organization. Your team is currently in the development phase and is about 75% done building the site. While the project is currently on budget and on schedule, you have burned up most of your contingency and know that the team has very little margin of error getting to the finish line. Read through the following scenarios and plan a strategy for responding to and managing the requested changes. During prior analysis and design phases you worked closely with project stakeholders to gather requirements for the site. You created detailed screenshots of all main site pages along with technical specifications and received formal verification from the project sponsor before transitioning into the development phase. An executive within the organization unexpectedly approaches you with some suggestions about the site’s appearance. After recently looking at several similar sites, he decides he would like to see a “fancier” design, including adding a flash introduction and interactive controls on the site home page. This particular executive is very opinionated and vocal and has already started to sell the idea around to others in the organization. - don’t delay in responding to change requests. It will build credibility and consistency with the client if you respond in a timely manner. Your team has been executing various IT projects within the organization for a long time and has established an excellent relationship and reputation with stakeholders. During the design phase you gathered their feedback mostly through informal meetings and conversations. Without any notice, the Project Sponsor leaves for another job and is replaced by a new person that was not previously involved in the project. The new Sponsor immediately requests a full project briefing and design review. During the review the new Sponsor generates a long list of change requests, some of which are minor but others that could require your team to re-build several modules in the site resulting in delays and cost increases. A teammate approaches you in a panic. A recently passed regulatory change now requires all newly deployed government sites to include specific design elements and content that you have not accounted for. Even worse, the regulation also requires you to submit new pages for third-party review and approval before you can deploy them. - consider other aspects such as how will you best utilize downtime. will resources still be available if you have to deal with significant delays? Woohoo, we have a plan! Now let's execute. But wait, we can't just start taking on tasks willy nilly. We have to develop our project team, and manage the execution. 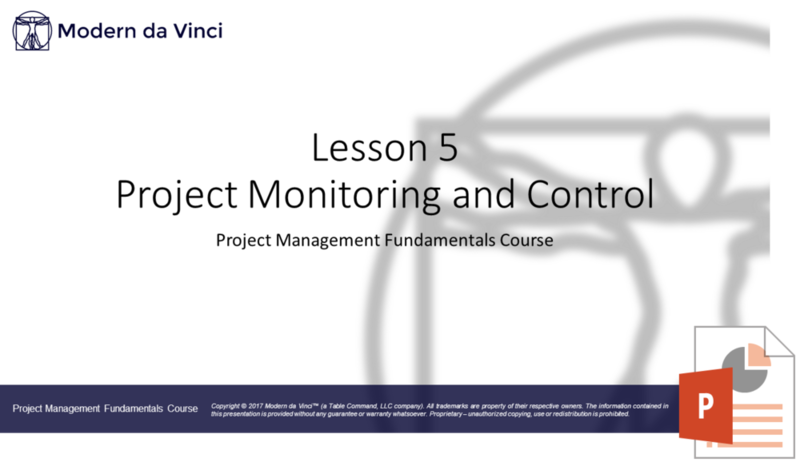 When you've finished this lesson, click the button below to move on and begin Lesson 5 - Project Monitoring and Control. Take this quiz before moving onto lesson 5 to ensure you've learned the concepts. Answers will be shown immediately after filling out and submitting this form. By creating a reward/recognition system. By understanding and applying management skills such as conflict management, negotiation, and leadership. By constantly monitoring and measuring performance against baselines. In most projects, the majority of the budget is spent during the __________ phase? How does the Project Manager and Team take timely corrective action? [CORRECT ANSWER] By constantly monitoring and measuring performance against baselines. What skills should a Project Manager be able to apply to their job? What is one method for creating a high performing team? What are the outputs of the Project Execution Phase? So, you've initiated your project with a Project Charter, defined your stakeholders, and defined a preliminary scope... now what? 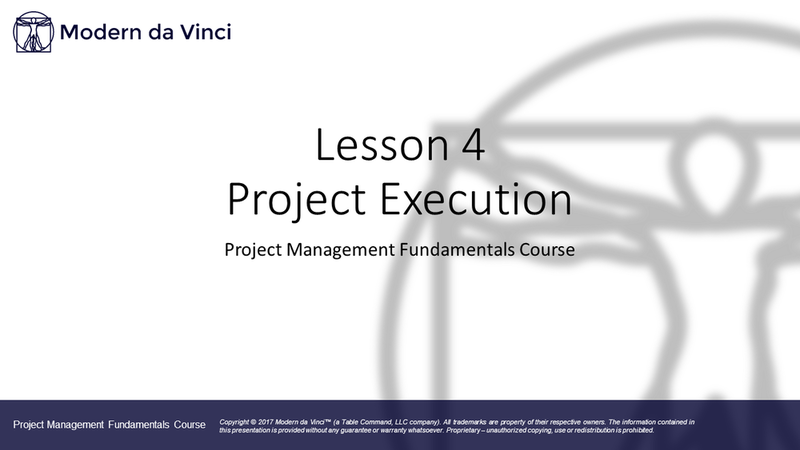 When you've finished this lesson, click the button below to move on and begin Lesson 4 - Project Executing. Take this quiz before moving onto lesson 4 to ensure you've learned the concepts. Answers will be shown immediately after filling out and submitting this form. It provides you with the requirements necessary to build a work breakdown structure. It documents a common understanding of the project work among stakeholders. It identifies uncertain events or contitions that could negatively impact the project schedule. Of the highest standard possible. With minimal defects and maximum features. Why is defining scope important? [COMPLETE] It documents a common understanding of the project work among stakeholders. In Project Management, quality is defined as delivering ______? [COMPLETE] Precisely what is promised. What activity is performed during Project Planning to determine the information needs of stakeholders? What is included in a Project Management Plan? This is a 2-part activity aimed at connecting the lessons learned here with an actual project you are working on now. Download the Risk List template (in the resources section below) from the Project Management Toolkit. Take a moment, using the guidance from Lesson 3, to fill out at least 3 risks to your project. These risks could be real or perceived, now or in the future. Make sure you add as much detail as you can in the description. Choose the type of risk (positive or negative influence on your project). Choose what area of your project will be affected by this risk (is this a project management problem, a technical problem, an external problem?). Enter an estimated probability that this risk will actually happen. Enter the impact that this risk would have on your project if it occured. Choose a response strategy... how you are going to deal with this risk if it happens. Will you avoid it, transfer it somewhere else, mitigate it, or just accept it and move on? Enter a detailed description of how you will respond to the risk should it occur. Download the Communications Plan template (in the resources section below) from the Project Management Toolkit. Take a moment, using the guidance from Lesson 3, to fill out at least 3 stakeholders and a plan for communicating with them throughout this project. Enter the type of communication you will enter into with each stakeholder. Consider what you will be communicating to them, what they are expecting to hear or read, and why the communication is important. List the audience or stakeholder for which this communication is designed. Enter the frequency of communication. Hourly, daily, weekly, other? Enter the channel of communication you will enter into with each stakeholder. Consider their needs. Is email the best way? Or perhaps a phone call, a meeting, or using some other type of technology. Enter a responsible person. Just one. Who will be responsible for communicating with this stakeholder? Enter the key messages this communication will contain. That's it! Keep these two documents handy (and updated) throughout your project. They will be extremely valuable to reducing project problems from unforseen risks and improper or poor communication between you and the project stakeholders. With the basics out of the way, we can now move on to the beginnings of a project, or Project Initiation. Some would say this is the most important part of a project as it defines how you will get started before you build a plan for project success. Going through the initiation phase will prevent unnecessary changes to the plan down the road. Once you cover these concepts, you'll be better off than more than 93% of people who feel unproductive at work (yes, that's a real statistic) because their projects aren't well defined. 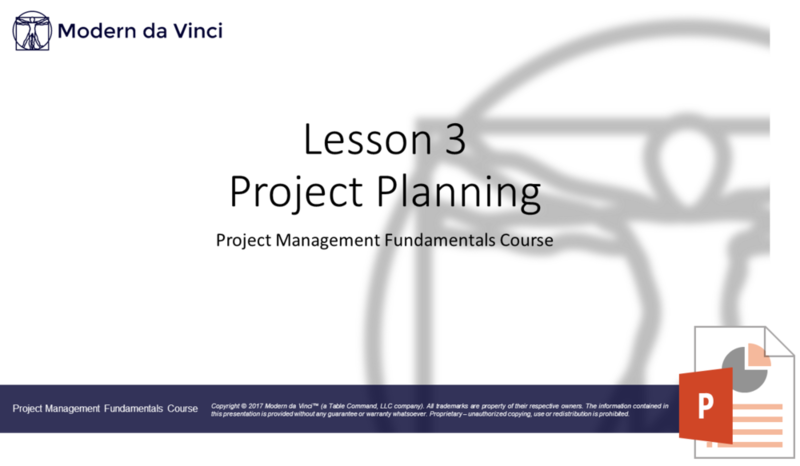 When you've finished this lesson, click the button below to move on and begin Lesson 3 - Project Planning. Take this quiz before moving onto lesson 3 to ensure you've learned the concepts. Answers will be shown immediately after filling out and submitting this form. It identifies customers who will buy your product or service. It identifies, prioritizes, and quantifies the needs and expectations of project stakeholders. Stakeholder analysis is an optional task that is only useful when a project team has more than 5 team members. Projects should be aligned with organizational strategy and strategic objectives. What is the high level document that communicates business need, preliminary project characteristics, authorizes the project, and identifies the project manager? When is influence in a project at its greatest? [CORRECT ANSWER] In the beginning. Why is stakeholder analysis important? [CORRECT ANSWER]It identifies, prioritizes, and quantifies the needs and expectations of project stakeholders. In this activity, we are going to look at a sample project charter created by company XYZ. The project team was in charge of a 5k fundraiser in the Washington DC metro area to raise money for XYZ foundation. They did their best to create a working project charter, but unfortunately it has many flaws. First, download the flawed Project Charter and review it in detail. Look for some things that may be missing or wrong and make a note of it. Once done, download the correct Project Charter and note the differences side-by-side. This activity will help you think actively about creating a project charter that works, and not a useless one that will cause problems down the road. In this lesson, we're going to start from the top. It may not seem important, but you'd be surprised how hard it is to properly define a project (hint, it's not just a group of tasks). When you've finished this lesson, click the button below to move on and begin Lesson 2 - Project Initiation. Take this quiz before moving onto lesson 2 to ensure you've learned the concepts. Answers will be shown immediately after filling out and submitting this form. It has a definite beginning and end. It contains a series of documents (such as a risk management plan, a project schedule, etc). It is developed by a team of 7 or more people. Relative to the size and complexity of the project. Limited to what management and leadership requires. Who is responsible for accomplishing project objectives? What is a key feature that defines a project? [CORRECT ANSWER] It has a definite beginning and end. Project management is the application of knowledge, skills, tools, and techniques to project activities to meet project __________. [CORRECT ANSWER] Relative to the size and complexity of the project. What are the phases of a project otherwise known as? In this activity, we want you to reflect on your past project experiences. They can be good or bad, and they can come from any project you've done either at work or at home. Write your answers in the text boxes below. If you would like the instructors to write back with guidance or further instructions based on your answers, please provide an email address below. Your answers will be mailed to the instructors who will review your answer and may write back with guidance or further instructions if you provided your email address. Welcome to the Project Mastery Course! Take a few minutes to go through this, then help us get to know you by filling out the form below. Once you're done, click the button below to begin lesson 1. Don't forget, at the bottom of every lesson page will be additional resources (like slides or worksheets) you can download and go through at your leisure. Before getting started, would you please take a moment to tell us a bit about yourself and where you are in your Project Management journey? What is your single biggest challenge when it comes to managing projects? What is the number one reason you enrolled in Project Management Fundamentals? What are you most excited to learn? Have you even bought other online training courses in project management? Books? Coaching? If so, please tell us what you got out of it and what was missing. Thanks for telling us a bit about yourself! I hope we get the chance to talk or exchange emails while you work your way through this course! Welcome to the Project Mastery Course! You made the right decision joining. We're excited for you to get started. So let's jump right in. Below is a synopsis of the course, and the course objectives. You should read through these and keep them in mind while going through the lessons. This course has an introduction, 5 lessons, and a summary and evaluation. Each lesson has a video, downloads, and a quiz to ensure you are learning and understanding the concepts. Go back and review each video and resource at your leisure, as many times as you want until you are comfortable with the material. Scroll down to see them all below and click the links to get started. At the bottom of each lesson (and this page), we usually have a Resources section containing all the downloads. This will include slides, worksheets, etc. If you ever need to reach us, email members@moderndavinci.net. Projects are temporary ventures aimed at producing a unique product, service, or process. In many cases, this uniqueness means there aren't any clear blueprints or steps in place to achieve the end goal. Project Management is the application of knowledge, skills, tools and techniques to reduce project ambiguity and risk while increasing the chance of successfully achieving project objectives. It provides a framework through which managers and team members can balance the constraints of scope, time, cost, and quality without sacrificing project requirements. 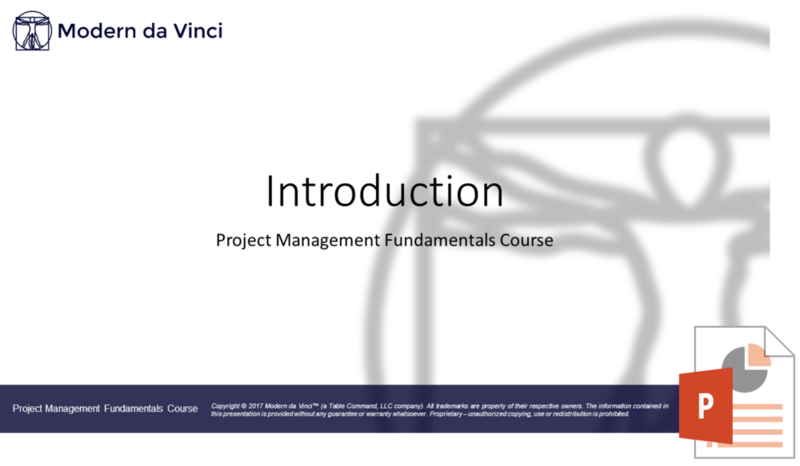 In this course you will learn leading approaches to Project Management as defined in the Project Management Body of Knowledge (PMBOK Guide). PMBOK is a globally recognized standard for project management. It provides guidelines for managing individual projects and for understanding project life cycles. 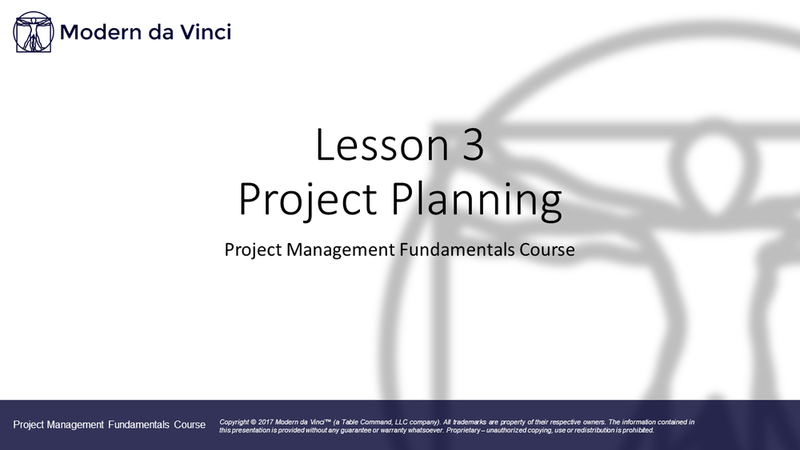 Within each area, the course will incorporate and address other key project management success factors such as leadership, team building, stakeholder engagement, and communication. The course will also address other leading project management approaches such as Agile and SCRUM to discuss how they complement and enhance the PMBOK approach. 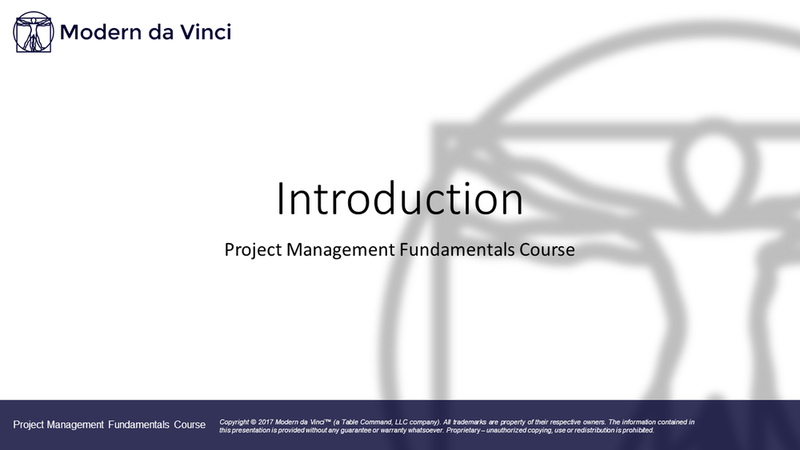 Gain an understanding of the project management principles, concepts, tools, and techniques applied across successful organizations and the global standards from which they are derived. Empower you with the vocabulary and knowledge needed to function at a high level in project leadership and supporting roles. Apply concepts learned in in the session to your personal or professional projects. Discuss how to best adopt and standardize Project Management processes and tools. Download the Project Management Toolkit with a quick reference guide and 7 templates you can use to kick off, manage, and close out successful projects. Download the full course outline with synopsis, objectives, and detailed breakdown of all lessons. Click any of the images below to download the individual guide or template.